The following information comes from city records, the St. Louis Park Dispatch newspaper, and phone directory ads. Please contact us with additions and corrections. The actual age of this building is unclear. City tax assessor records have both 1894 and 1940 typed on the earliest cards. An article in a 1953 Dispatch quotes an oldtimer as saying that a grocery store was built here around 1930. That year a Henry Melius had a store here, and was cited for selling liquor. 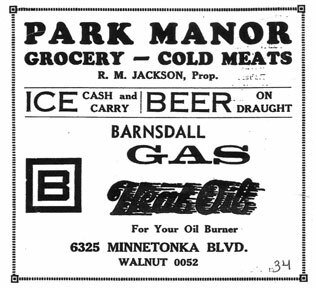 In 1933 Richard M Jackson and his wife Gladys ran the Park Manor Grocery and Lunch. The store featured ice (cash and carry), Park Manor Barnsdall gas station, and Heat Oil for your oil burner. 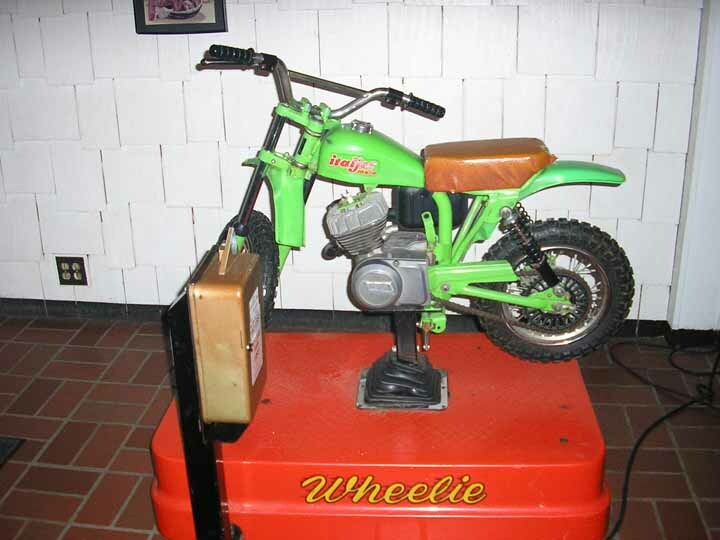 You could also get beer on draught, a novel idea pairing beer at a gas station. Plumber Tom Motzko connected the building to the Village water main in June 1933. On the permit the building is referred to as a house, measuring 11 ft. across and 14 ft. deep. Jackson added a shed, ice house, and screened porch, also in 1933. The dimensions became 16 ft. across and 20 ft. deep. Richard Jackson is listed in the 1933-34 directory at both this address and at 5209 Minnetonka Blvd., a duplex built in 1928. 1934-35: Same as above, except that the Jacksons are listed only at the 6325 address. There is one reference to it as the Park Manor Inn in 1934. In 1938 it became Moscrip’s Grocery and Meats/Monarch Foods. Bottled beer, ice cream. Moscrip’s Gas Service. William G. Moscrip was born in 1875 in South Dakota. From 1910 to 1935 he was a farmer in Montana. 1939: Same as above except Standard gas service. 1940: Moscrip’s Grocery, Moscrip’s Gas Service. In the 1940 census William was listed as store proprietor, with his wife Eva, unmarried son Edward, and two lodgers living in and working at the store. Edward was born in 1920 and by 1940 had had one year of college. The lodgers may have lived in the basement. A bathtub was installed on the first floor in 1940. 1941-42: Moscrip’s Grocery and Meats, Bottled Beer, Ice Cream, Mobil Gas. William and Eva lived at the store. Edward married Anna Mae and was listed at 5908 Minnetonka Blvd. The house at that address now was built in 1944, so that house was either replaced or renumbered. 1944: According to the directory, William, Eva, Edward, and Anna Mae lived at the store. 1945-49: Edward and Anna Mae Moscrip were listed as living at the store and William and Eva were at 5908 Minnetonka. Mobil Gas. 1950: All of the Moscrips were living at 5908 Minnetonka, and Edward has gone into insurance. 1950-51: In the March 13, 1951 issue of the Echo there is an ad for Gilborn Grocery and Meats at this address. A permit was taken out in 1950 for an ice cream cabinet for the Gilborn Grocery. The 1951 directory lists it as Gilborn Market and Alvin S. and Forella Gilborn at 6324 Minnetonka, which is apparently a typo. No gas is mentioned. In 1950 the name W.H. Gronhotz is listed in Village records, but he may have just been a contractor. In a January 1952 issue of the Echo is an ad for Kent’s Grocery, Kent being Henry E. “Hank” Kent. 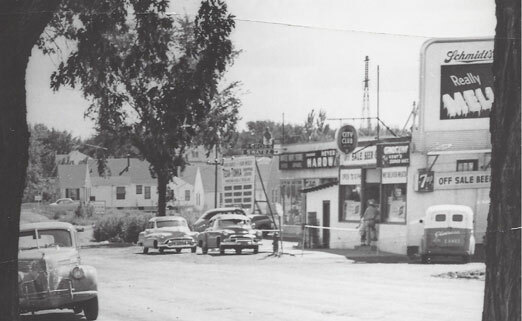 The photo below shows the store with a big City Club sign over it – a beer brewed by Schmidt’s until 1954. In 1952 Kent tore down two sheds on the east side and put in an $8,000 addition (built by Paul Boline) to the south, virtually doubling the building in size. He also installed two bathrooms in the basement in 1952. He renamed it Kent’s Big Ten Food Store. 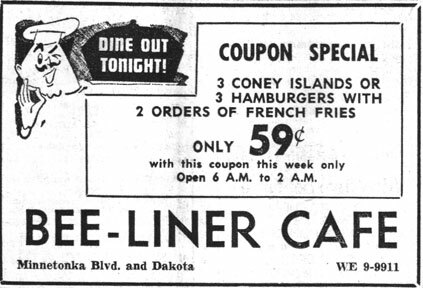 Approximate dates of the Bee Liner Diner are 1954-56, and it may have been run by Marie Williams. There is no sign of Moscrip, Gilborn, a grocery store, or gas station at this address in the directory. In preparation for conversion to a diner, a stove, dishwasher, water heater, and food warmer were installed in 1954. 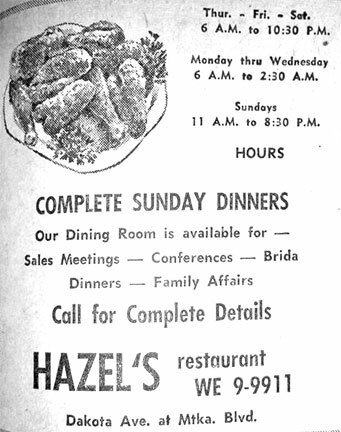 This ad was in a 1956 Dispatch, and it may have been a short iteration of the parade of restaurants in the building. Thanks to Al Hartman for the find! 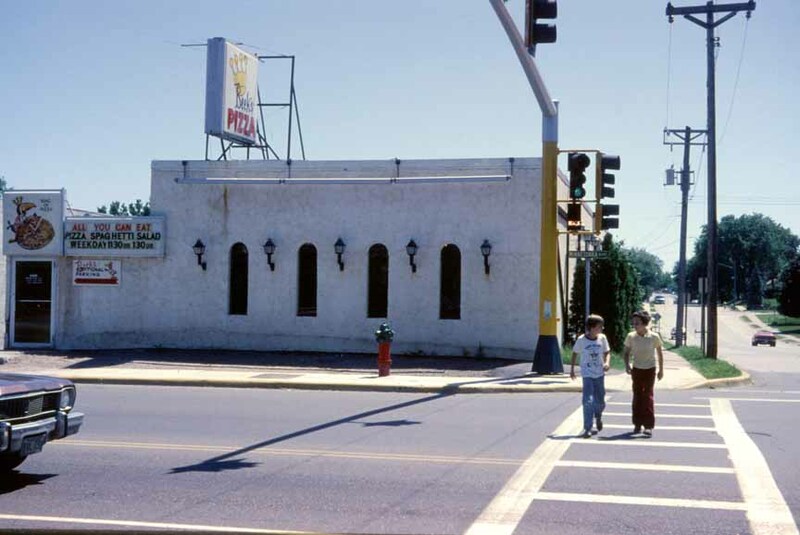 On May 2, 1957, Truman and Myrtle Hedwall opened Myrt’s Cafe. It was unusual in that it specifically welcomed teenagers; Mrs. Hedwall (wife of a Park fireman) said that “a jukebox, fountain service, and friendly atmosphere will make our place a wonderful place for Teen Agers to gather.” The Dispatch opined that “It will be one of the few places in St. Louis Park – if not the only one – where youngsters will be welcome after the supper hour.” At the Grand Opening, popular disc jockey Jack Thayer was on hand to sign autographs and hand out free records. A couple of weeks later an ad invited kids to bring their parents to Myrt’s so they could see “where junior and miss spend their evenings.” It added, “It really jumps with rock and roll, but rock and roll under control.” In June kids were encouraged to bring their dads to Myrt’s for Fathers’ Day. But in mid-June a huge brou-ha-ha emerged when a policeman told Councilman Gene Schadow that a highly elected official told the police to “lay off” enforcing laws at the teen hangout (re: drinking, smoking, curfew). In addition, scores of neighbors complained about the noise, fast driving, late hours, violence, drinking and general hijinks, including the impeding of traffic on Minnetonka Blvd. by kids jumping across on pogo sticks. 200 people signed a petition to close Myrt’s, saying women were afraid to be on the street at night and they were afraid a riot might ensue. The next week things cooled down, Schadow withdrew his charges as a misunderstanding by police, and some neighbors offered to help work things out. A letter to the editor from some teen customers defended their place, saying they had cleaned and fixed up the basement, rented the juke box, and created their own Board of Directors. They also said that they appreciated having a place “where we don’t have to spend any money if we don’t want to,” which probably did not bode well for the economic viability of the place. And they alluded to another Park restaurant that received notoriety as a teen hangout last year that was shut down, and that if Myrt’s was closed they’d just go somewhere else. 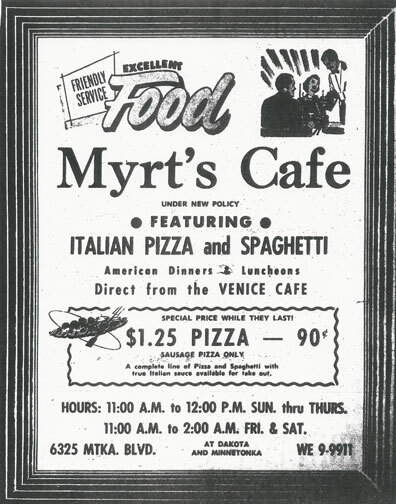 An August 1, 1957, article in the Dispatch said that Myrt’s was remodeling to designate a cafe for teens in the basement and a restaurant for adults upstairs. Teens would require membership cards to enter. The new policy was said to eliminate many features which have caused some criticism in the past and provide for adequate supervision for the “rock and roll” group who prefer hamburgers. There was a large ad for Myrt’s in the August 8, 1957, issue of the Dispatch, but that’s the last mention of Myrt’s in the Dispatch. The Dispatch had ads for Dell Ambulance at this address from May 22 to June 26, 1958. Very curious! Apparently at one time vehicles could be driven directly into the basement. This business was run by Kenny Grandell and Wally Berg. 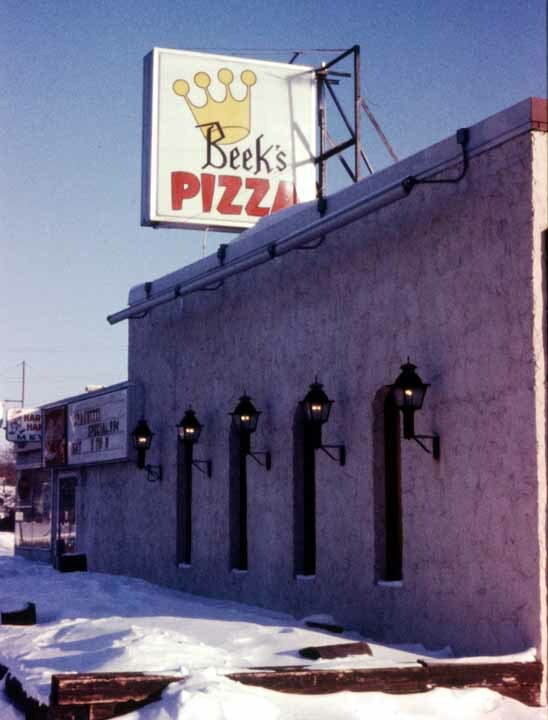 Beek’s was a local chain of sorts started by Charles Beekman in a converted fruit stand at 3836 Hiawatha Ave. in Minneapolis in 1953. He had been a bread delivery driver, and got the idea for the pizza place from Max Pizza in Wayzata, according to Robert Cowan. 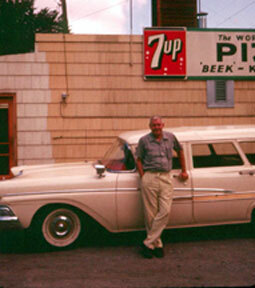 Beek’s Pizza is named for Mr. Beekman, its original owner. 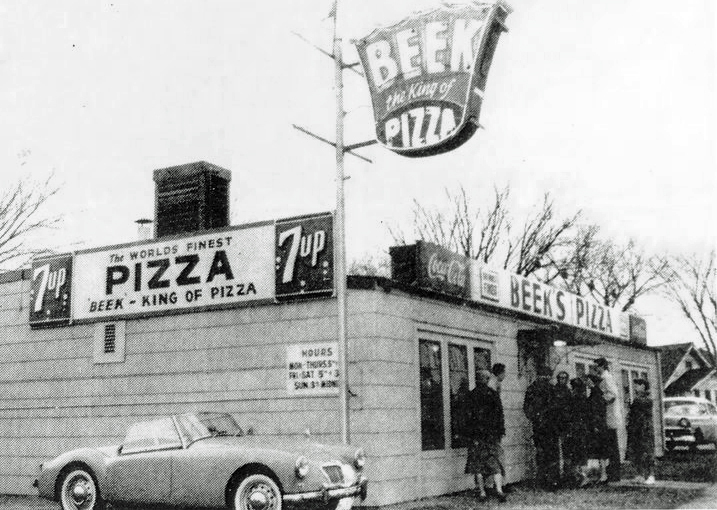 Back in 1953, Beekman opened his first neighborhood pizza parlor on Hiawatha Avenue in Minneapolis. The place was small, cramped, and had a leaky roof. But it had atmosphere… and the pizza was great! Beek’s Pizza became “the place:” high-schoolers gathered on Friday nights, the guys brought their dates, and families came too. Beek’s secret? ‘Old World’ flavor that was fresh and homemade. The pizza dough was made daily from scratch. Sound good? The delicious, tangy pizza sauce, spaghetti sauce and meatballs were homemade too. 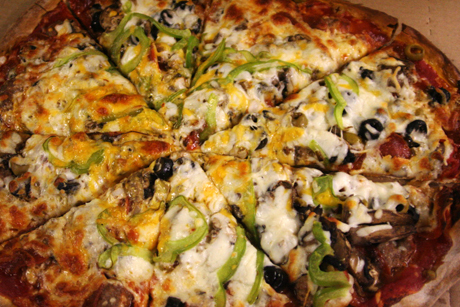 Only the freshest meats and vegetables went into Beek’s pizzas. There were no preservatives in the meats or cheeses; only the finest ingredients were approved, including imported spices. And they were all smothered in gooey mozzarella cheese. That was over 50 years ago… and the tradition continues today. We still put it all together according to Beekman’s original recipes. The recipes are committed to memory and relied upon every morning to make the dough, pizza sauce, meatballs, spaghetti sauce, and our NEW original chicken wing sauce. It is all homemade and “hand-made”; we even mix the “secret recipe” spices by hand! We demand the freshest ingredients and they remain free of preservatives. Every Beek’s pizza is still topped off with real mozzarella! 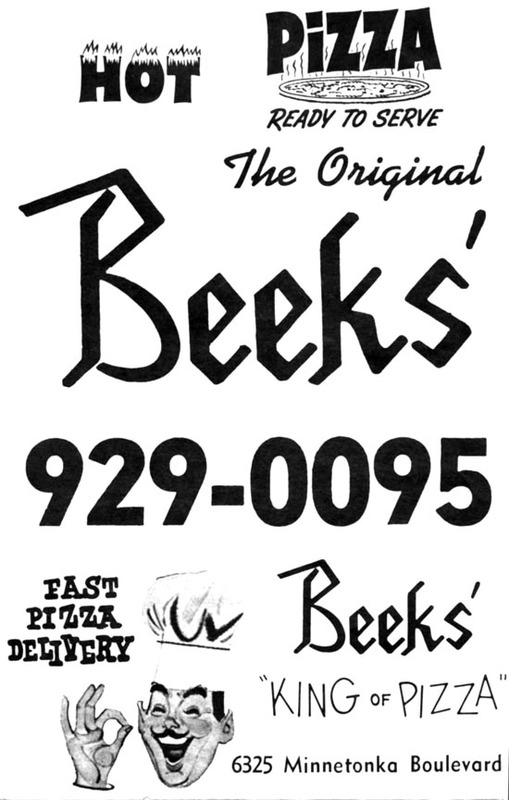 Beeks is also known for, remembered and sought out for our distinctive and delicious THIN CRUST! It’s the only crust we offer and we think we have achieved perfection. Hard to believe? Well, we “learned from the master,” so to speak. And early every morning the Beek’s kitchen is brought to life with the sound of the ol’ Hobart mixer turning out its daily batch of hand-made dough amidst the smells of the simmering homemade sauces… still the secrets of Beek’s ‘Old World’ taste! We remain committed and proud to be independently owned and operated: no corporate parent company dictates our decisions or our future. 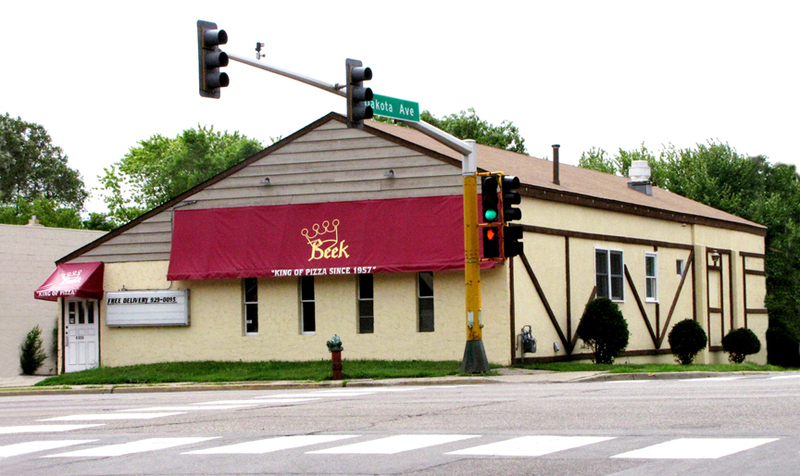 Beek’s Pizza is eager to serve you at 6325 Minnetonka Blvd. in St Louis Park, opened in 1957. Our children have grown up in our pizza world and work along side of us today. Our staff IS our family… so you see, the business of pizza is something we take personally! The result? The finest pizza this side of ’53. We have the most loyal customers and look forward to meeting you! We appreciate each and every order, whether we deliver it a block or you drive 30 miles or more to get your “Beeks fix.” You are important to us. Please accept our sincere thanks for your loyalty and patronage. 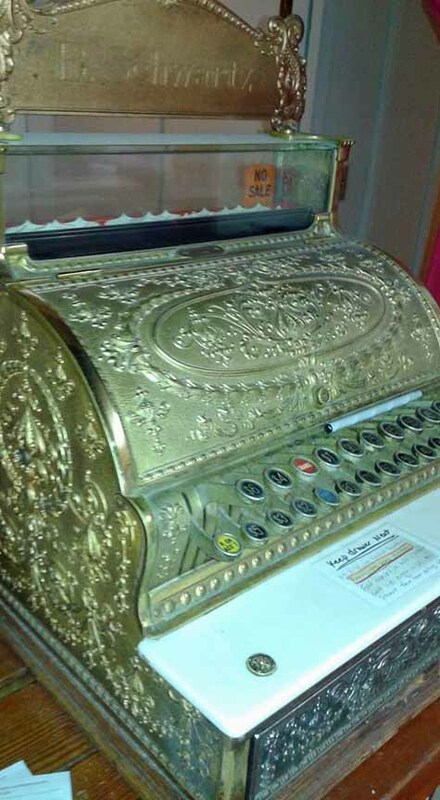 From the phone number we can tell that this is from the Lyndale store, but it’s a cool picture! 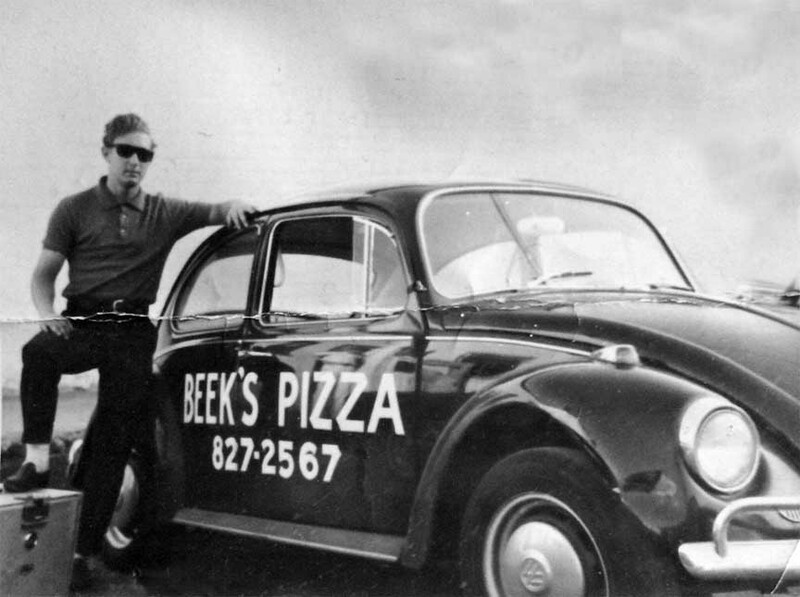 Beek’s used VW Beetles with heaters to keep the pizzas warm during deliveries. Plumbing work was done in April 1958. Beekman installed air conditioning in June 1958. Beekman installed three ovens in June 1958. The first mention of Beek’s in the Dispatch is a very large ad on July 3, 1958, touting the “new, exciting” Italian Garden with “ultra modern décor.” There were pools and falls with tropical fish as well. 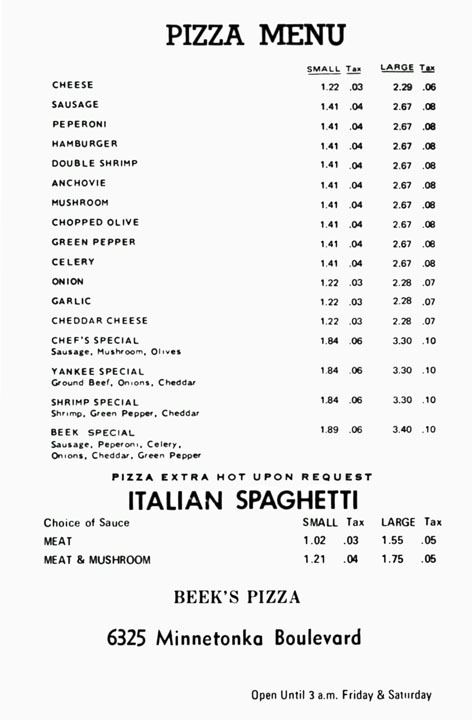 The menu included 17 kinds of “old world pizza,” spaghetti, sandwiches, and hamburgers. Hours were late: midnight on Sunday; 1am Monday-Thursday; 3 am Friday and Saturday. 3836 Hiawatha Ave. – 1953, demolished to make way for today’s light rail system. Beekman had a series of heart attacks in 1961, and sold the St. Louis Park building to Philip E. Bang and Robert Lee Cowan in September 1961. Bang and Cowan were childhood friends, newly graduated from Roosevelt High School in Minneapolis in 1960. Cowan had started working as a delivery boy for Beeks’ Hiawatha store in 9th Grade, and moved up to Cook in 10th Grade. They were faced with a trial by fire of sorts when St. Louis Park won the 1962 State Basketball Championship, and Beek’s was Celebration Central. Cowan and Bang were just a year older than the students and could hardly keep up. Plus the place was trashed! As Cowan married and had children, the family worked at the store. The building was remodeled in 1968, with dimensions recorded as 40 ft. across and 60 ft. deep. In 1994 Robert Cowan convinced Phil Bang to buy him out, and from that point on, Phil and Mari Bang owned the property outright. Philip E. Bang died on March 8, 2013, and the property went to his second wife, Mari. Beeks Pizza has closed effective today – Monday, November 14, 2016. The Beeks property at 6325 Minnetonka Boulevard in St. Louis Park has been sold. The option to relocate Beeks Pizza is no longer being considered. This has been a difficult decision for our family, knowing Phil dedicated an entire lifetime of “blood sweat and tears” to build and prosper the Beeks business he dearly loved and enjoyed. Leaving behind an entity that has been an integral part of each of our lives is not easy; change is difficult. Blessed be our memories of Beeks and the beloved man who worked tirelessly to build his successful dream. In the end, my desire to pursue new and exciting professional opportunities, to begin a new chapter of my life with my loving and supportive fiancé, and my deep need and desire to ENJOY my beautiful children and be a part of their lives has trumped the satisfaction and pride that comes with owning a successful small business. My family joins me in sincerely thanking our Beeks customers for your patronage and incredible loyalty. To the Beeks staff-past and present – you are FAMILY, now and as I move forward. 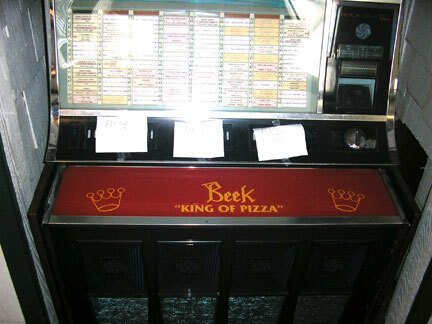 Each of you contributed to the amazing success of Beeks Pizza. My prayers for your personal success and happiness.